This is the F3 Neo Flight Control Power Distribution Board (FC/PDB), which forms part of the Seriously Pro Neo Stack (FC/PDB + OSD/VTX). The Seriously Pro Racing F3 NEO Stack comprises of two parts, a PDB/FC and an OSD/VTX board which stack together to form the core of your racing drone. The stacking design makes for an extremely compact and easy to install solution, with the minimal of solder connections and external cables required. For beginners it simplifies the build, for advanced race pilots it delivers one of the most powerful racing drone flight controllers on the market in a very compact package. The Seriously Pro Racing F3 NEO board (SPRacingF3NEO) is a full-featured flight control board designed specifically for FPV racing quads. It uses the latest gyro technology and a next generation CPU to deliver unparalleled flight performance, while its integrated PDB and BECs make for a easy install. As a flight controller PDB, it supports every feature you'd need in a racing quads, such as: DShot ESCs, all main RX protocols without inverter, programmable LEDS, current monitoring, telemetry blackbox recording and iLap transponder race timing. Easy Installation: The SPRacingF3NEO is the easiest system to install yet. Just solder 4 wires per-corner, solder on an XT60 battery connector and you're ready to fly. Team-Race-Ready: Race features include race transponder support for lap-timing and a VTX that can be disabled remotely! The VTX can be off-by-default and turned on/off via a spare RC transmitter AUX channel - if your relay-race team pilot crashes they can turn off their VTX so you can fly on the same frequency! The iLap compatible race timing transponder system was used at the World Drone Prix and the Drone Nationals. The NEO Stack comprises of two boards - each available separately. The NEO FC/PDB can be used on as a FC on its own, without the NEO OSD/VTX add-on board. FC/PDB with Accelerometer & Gyro Sensors; MicroSD card socket, LC Filter, Current Sensor, Receiver cables, sockets and pin headers. FC/PDB board with Accelerometer & Gyro Sensors; MicroSD card socket, LC Filter, Current Sensor, Receiver cables, sockets and pin headers. OSD/VTX board with 25/200mW VTX (40 Channels with Raceband) and camera cable. The SPRacingF3NEO FPV Stack has Flight Controller (FC), Video Transmitter (VTX), On-Screen-Display (OSD) and Power Distribution Board (PDB) features that makes it the board of choice for any new low-profile multi-rotor build. The SPRacingF3NEO uses advanced processor, sensor and software technologies to make your aircraft fly like it's on rails. The SPRacingF3NEO flight-controller and the Cleanflight software enables the precision flying you need for fast FPV racing. 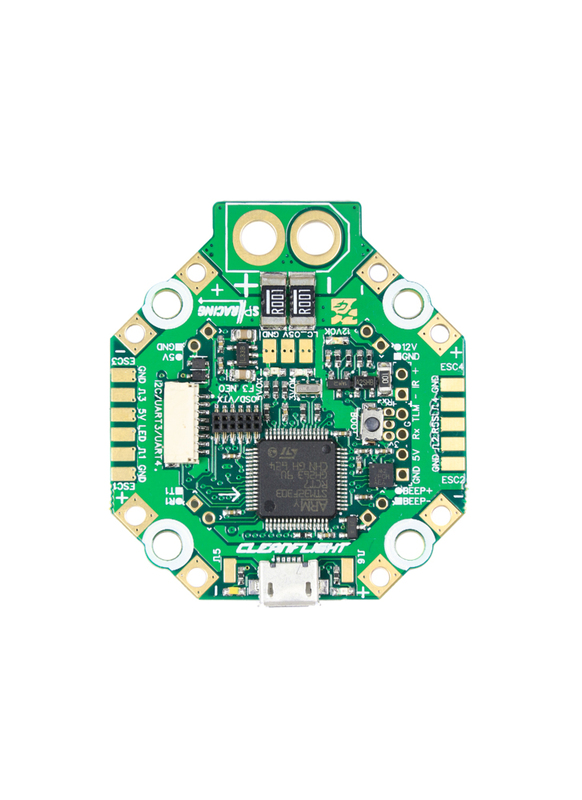 The SPRacingF3NEO has an ARM Cortex-M4 72Mhz CPU with Math co-processor (FPU) for efficient flight calculations that gets more done in less time. 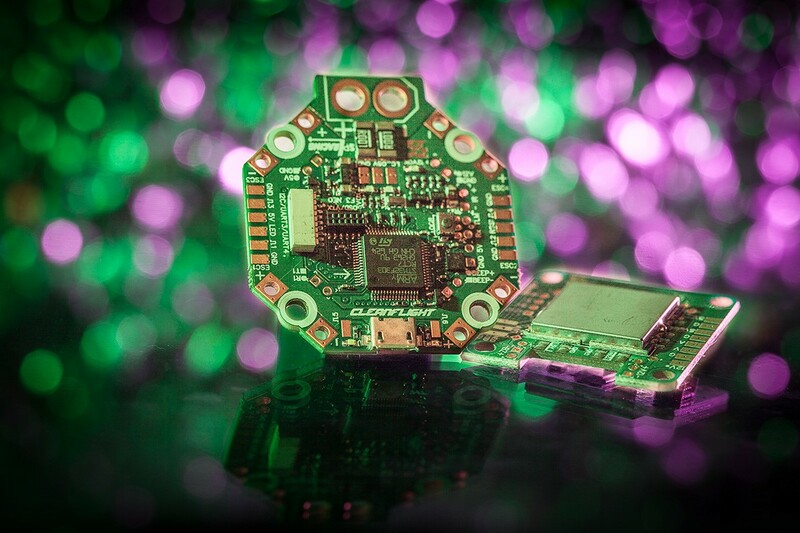 The latest CPU allows Gyro and Accelerometer sampling many timer faster than previous-generation STM32F1 based boards. The SPRacingF3NEO features a MicroSD card socket for logging. Supports MicroSD/SDHC up to 32GB - just leave one in and log every flight! The SPRacingF3NEO OSD/VTX features a button for changing VTX channel, band, RF-power, VTX ON/OFF and more! The SPRacingF3NEO is the first Cleanflight FC that allows you to use the transponder feature and the programmable LEDs at the same time! * DSHOT support coming soon, the NEO hardware supports DSHOT ESC signal generation. The SPRacingF3NEO is the only team-race-ready system. If your team mate crashes-out on the track they can turn off their VTX remotely so you can fly on the same VTX channel. The SPRacingF3NEO runs Cleanflight which can be configured to suit your needs using a cross-platform GUI (Windows/OSX/Linux). The SPRacingF3NEO features a race transponder timing system. As you fly around the track the FC continually transmits your unique code via IR. As your aircraft passes the start/finish timing gate the track-side receiver records your lap-time. *Transponder code and IR-LED available separately.